BOSTON -- The mother of a Massachusetts Institute of Technology police officer killed by Boston Marathon bomber Dzhokhar Tsarnaev was so distraught by his death that she could not get out of bed for months, the officer's stepfather testified Wednesday. 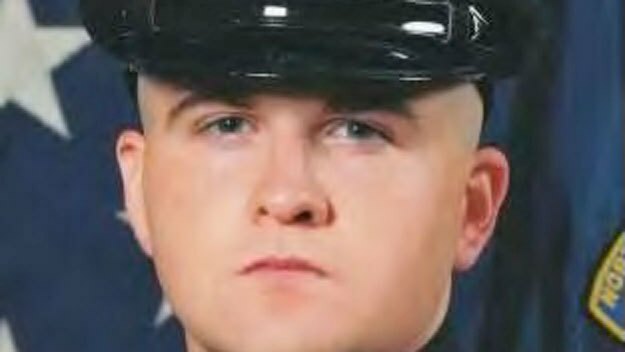 Officer Sean Collier was gunned down three days after the bombing as Tsarnaev and his brother, Tamerlan, were trying to flee. Tsarnaev, 21, was convicted this month in the bombing and Collier's killing. The jury is now hearing testimony on whether Tsarnaev should be put to death. Collier's stepfather, Joseph Reynolds, described a close-knit, blended family that formed when he and Collier's mother married in 1993. Reynolds said he raised Collier from about the age of 6. "It was sort of a 'Brady Bunch' situation," he said. Reynolds, as well as Collier's younger brother, Andrew, described Sean as a kid who always had a strong sense of right and wrong, down to putting bugs outside rather than killing them. "Sean was a moral compass, that would be a good description. He was the one always fighting for what was right," Andrew testifies. Andrew: "Even when we're having fun, there's always a cloud. I miss Sean, I miss everything about him." "He was a cop at an early age," Reynolds said, testifying on the second day of the penalty phase of the trial. At least one juror wiped away tears during Rogers' testimony, reports WBZ-TV's Jim Armstrong, who said that Tsarnaev smiled broadly when he entered the courtroom on Wednesday morning. Big smiles from #Tsarnaev as he is escorted into court; immediately starts conversation with defense atty Miriam Conrad. Three people were killed and more than 260 were injured in the 2013 bombings. Tsarnaev was convicted earlier this month of all 30 charges against him during the trial's guilt-or-innocence phase. Tsarnaev's lawyers say Tamerlan masterminded the bombing and recruited his impressionable younger brother, then 19. They argue that Dzhokhar does not deserve the death penalty. Prosecutors showed the jury a series of photographs of Collier as a child and a picture of him at his graduation from the police academy, his mother pinning his badge on him. "That was probably the happiest day of his life," Reynolds said. Prosecutors say the Tsarnaev brothers shot Collier in his police cruiser during a failed attempt to steal his gun. Hours earlier, the FBI had released photos of the brothers as suspects in the marathon bombing. Reynolds said Sean's mother has been diagnosed with post-traumatic stress disorder and has not been able to return to work. "It's been a terrible two years," he said. The penalty phase in the Boston Marathon bomber's trial opened Tuesday in dramatic fashion, with prosecutors portraying Tsarnaev as a coldblooded killer and "America's worst nightmare." The government then began trying to drive home the horror of the attack by calling to the stand witnesses who lost legs or loved ones in the April 15, 2013, bombing. A recent poll showed a majority of Bostonians are against Tsarnaev paying with his life.